The winter of 1934 was one of those biting, unforgiving winters where everything freezes solid and there’s nothing to do but keep frostbite at bay and wait for spring. But a group of duck hunters who often met for coffee in Myron Perry’s Drug Store in Quogue became alarmed as they watched the dwindling number of ducks who could survive here as all the East End waters froze over. Among them were the druggist himself, Charles Banks Belt, Russell Carman, Ross Federico, Bert Pierson, Waldermar Burding and other duck hunters, who decided to do something to protect the ducks. They were granted the use of the pond at the Quogue Ice Company at the end of Old Country Road, where they cut a hole in the ice and brought in black ducks to overwinter in the only open water for miles around. Today, that pond is in the center of the Quogue Wildlife Refuge, which is celebrating its 80th Anniversary this year. In the decades since it was founded, the refuge’s weaving, secluded trails have become part of the childhood memories for many East Enders, who in turn bring generations of children back to walk the trails and watch the waterfowl they saw there as children. Ms. Nelson said the refuge is holding a celebration this year because people who remember the early days won’t be around if they wait to celebrate until the park is 100 years old. She’s looking for people who have memories of the refuge to send in stories and photographs, and is hoping to put together an oral history project with some people who remember the early days. Tentative plans are in the works for a celebration this fall. Luckily for the refuge, many people whose relatives were involved with starting the refuge are still involved. The refuge’s staff recently found an old film of workers digging out the northernmost of the refuge’s three ponds. They showed it to Ed and John Belt, relatives of Charles Banks Belt, whose name graces the refuge’s nature center. Memories of the refuge can be sent to info@quoguewildliferefuge.com or P.O. Box 492, Quogue, NY 11959. For more information, call the nature center at 653.4771. The refuge isn’t just for ducks and people. 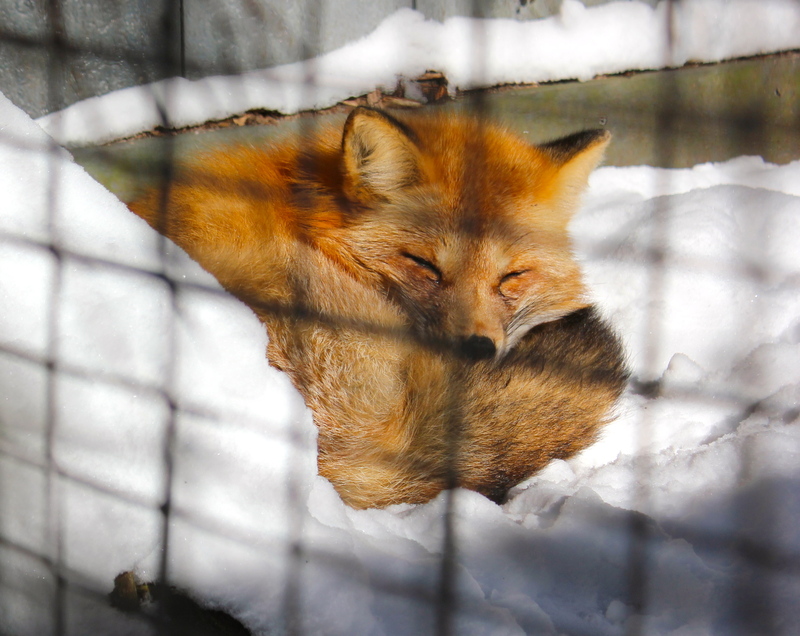 A handful of injured foxes, eagles and a bobcat are housed there, including a bald eagle who may be 28 years old, and a pair of foxes who are just getting acquainted to life in the same pen together, after living next door to each other for quite some time. Early in January, a wild turkey with an injured leg joined the crew at the refuge, after spending some time rehabilitating at the Wildlife Rescue Center of the Hamptons. The turkey brought along her best friend, a guinea fowl, who now joins her in her pen. The refuge also continues to offer some tried and true classic programs, like its school break camps, full moon walks, reptile talks and a spooky walk at Halloween, and they’re always adding new programs, including a “Light the Night” trail walk held in the weeks surrounding Christmas and a magical performance art piece called “Zima” with the dance troupe Neo-Political Cowgirls. “People like to come for the familiarity. We add things in gradually. But we’re also growing and keeping the programs interesting,” said Ms. Nelson.